Standing at about Five foot eleven inches, Kakashi Hatake is a tall man who is fairly skinny. With light grey hair that shoots up into the air like a scarecrow's and a calm and relaxed look on what you can see of his face, he seems to be a collected man. Wearing a Village Headband over his left eye at all times except during the few occasions he needs to use his Sharingan, he keeps it covered to conserve chakra and intentional or not, to hide the scar over his left eye as well. Wearing a Navy Blue Mask over his face as well, the only thing that can be really seen of his face is his right eye, which you mostly have to look at to tell what he is feeling. Wearing the Traditional Navy Blue shirt with the red swirls on it, Kakashi also wears the standard Chuunin and Jounin Village flack jacket with all the pockets and accessories that come with it. On his hands he wears something from his old ANBU days, the armor platted fingerless gloves, which have saved him a number of times in the heat of battle. Next his Navy blue pants, which he has bandages wrapped on his right leg and a Kunai holster as well. Around his ankles are also these same kinds of bandages and his navy blue Ninja sandles. Looking like nothing more than your typical Konoha Shinobi, nothing really stands out besides his gray scarecrow hair. Personality: The death of his friend and comrade Obito had a huge impact on Kakashi’s personality and life. Because of his friends death he began to loosen up more, become more laid back and less punctual then he was during his early childhood. Now calm and with a cool and detached demeanor, he has been called cool and hip and even a few times he has been called trendy by his so called “rival” Mighto Gai. And despite all of his reputation as a Shinobi, Kakashi shows no arrogance and is actually very modest about his abilities. He uses his naturally calm personality and state of mind as an advantage in the field of battle and it is easier for him to stay focused on the situation at present, and notice everything around him. A huge fan of the Icha Icha novels, he is normally seen reading one of these many books and when not involved in a fight, he makes it one of his hobbies, Despite his love of the books, he is very uncomfortable reading the book to other people. Despite all this, Kakashi is a very responsible and dedicated person when it matters. He does everything to protect his Village and his friends, even his signature Jutsu, Chidori, was made to protect his Village. He places the safety of his friends and team above the success of the mission. Kakashi used to believe the mission was more important, but since the death of his comrade and friend, Obito, he has changed his views. He now takes every morning to go visit his friends grave marker, then making silly excuses for why he is late for things. Description: Sharingan is the blood inheritance limit of the Uchiha Clan. The Uchiha are said to be descendants of the Hyuuga, with the Byakugan changing into the Sharingan over time. This doujutsu (eye skill) gives one the ability to read Genjutsu, Taijutsu and Ninjutsu and then defeat it. As such, the clan member can view a technique being performed and almost instantly memorize the movements required to be able to complete it, including the needed chakra moldings and seals used. However the clan member cannot copy techniques that are unique to another bloodline and the clan member must have a body capable of meeting the chakra and physical requirements to do the jutsu. This rarely stops the clan member though, as such stressful situations often push their limits farther and allow them to harness their full potential. Description: This Doujutsu is a Ninjutsu technique which uses a form of the Mangekyou Sharingan eye to launch a long range attack. To begin Kakashi forms a handseal to change his normal three tomoe Sharingan into a new Mangekyou form, or he can not use a hand seal at all, but that causes more Chakra. He then focuses on an area of his target. The surrounding area then begins to warp and collapse in on itself, quickly reducing the surround area to nothingness. The technique will thus essentially transport the focused area away to another location. The technique caused a huge strain on Kakashi, utilizing a great deal of chakra. He is able to use this technique three times per day. Kakashi was the son of Sakumo, a Ninja who was extremely skilled and earned the nickname of the white Fang, this was due to the family Tanto which he carried, and the white chakra which the tanto emitted. Sakumo was on par with the reputation of the Sannin of Konoha, but his attitude led to his death. Sakumo aborted a mission that cost the Village a great deal. The abortion of the mission was because the safety of his comrades. Ashamed of his actions for what he had done, Sakumo, the White Fang of Konohagakure, took his own life. Kakashi accomplished much in his younger years during his life. He was the student of the man who would go on in the future to become the Fourth Hokage, and taking the position of commander of the team. His reputation had spread quickly and was very widespread since his first mission that he performed as a Jounin. The War Mission seemed simple enough; Kakashi was tasked with destroying a bridge that aided the enemy Iwagakure Shinobi forces. In an encounter with the, the Team medic, Rin was kidnapped and interrogated by the enemy Shinobi. Kakashi saw her as a problem and unneeded burden to the team, so he made the choice to leave her to fend for herself. But his other teammate had other plans. A Uchiha by the name of Uchiha Obito, refused to do this and defied Kakashi. “Those who don’t follow the rules and regulations are trash”. Kakashi lived by the motto and followed it to the T. “But those who don’t care about their companions are worse than trash!” Obito added to it. Obito set off on his own to rescue Rin, but Kakashi followed him and saved him from an ambush luckily. Then Obito was consumed with doubt about the Mission, which made his Sharingan spring to life. With his newfound power he was able to find the enemy Ninja and bring them down. When they caught up with Rin, they ran into more enemies. These men attempted to kill all three by crushing them with falling rocks from a cliff. As one was about to fall on Kakashi, Obito threw himself at Kakashi, knocking him out of the way and Obito himself taking the hit instead. Obito knew he was going to die and he would die soon, so he made the decision to have his left eye removed and implanted into Kakashi by Rin. Kakashi accepted this gift and sought revenge on the Iwagakure Shinobi who had done this to his comrade. The battle broke his family Tanto in half, and then Kakashi used his first self created move: The Chidori. The Iwagakure Shinobi was killed, but reinforcements soon arrived. Luckily, the kunai that Kakashi was carrying was altered so as soon as it was thrown, their Sensei would be alerted to their location. Soon after, Kakashi blacked out from the exhaustion of using his Chidori. Kakashi woke to find all the enemy gone and his team leader with him and what was left of the team. Since the loss of his comrade Obito, Kakashi has taken son several of his personality traits, relaxing more and letting up on his punctuality and also started to make poor yet very funny exuses for being late to things. But the truth is that Kakashi visits his friend Obito everyday at the grave marker, which is the reason for his lateness. In the coming years of Kakashi’s life, he would acquire his own nickname. This nickname was, Copy Ninja Kakashi. This was all in part to his ability with the Sharingan to steal and adapt Techniques he saw. He would go on to join the ANBU elite, a squad of Ninja who worked under the direct supervision of the Hokage. It was here that Kakashi further increased his Skills and earned the respect of many fellow ANBU. It was also during this time that Kakashi and Mighto Gai formed their rivalry. This is also the time it is assumed that Kakashi formed his blood oath with his Ninja-Dogs. After that was Ninja village, and I've done naruto ever since that, 4 years ago. Near studied the opponent as the ninja performed some sort of trick. Near eyed the liquid on his body, and recognized the blue color. Near had already confirmed that his opponent was immortal, or at the very least unscathable. Therfor, self mutilation was not out of the question for this ninja, nor were suicidal tactics. He recognized the color of the chemicals that were seemingly invisible. The color that was their was recognizable as highly reactive because of it's energy levels. Colors are infact, direct indicators of the electrons in the energy levels of chemicals. The color of this substance suggested that it was highly reactive, and would there for be used for some sort of chemical combination, or perhaps an explosion. Either way, Near would not have this. Near made a handseal, and a shadow clone appeared behind him. They both did the kawarmi, but moved only inches, switching places perhaps, but mostly doing so just to confuse the opponent. The real Near made handseals, and placed his hands on the ground. He located the every present underground water source, as little as it was. Using this, he brought it up and magnified it with his own water chakra. It shot out of the ground and shot at the opponent in the form of mud, combined with the earth beneath the layer of sand, The giant mudslide shot at the opponent, almost inescapable, which would wipe any chemicals from the battle field. Near smiled, and he as well as the shadow clone ran at the opponent, switching places almost unoticeably to hide their presences. They simply ran along the mudslide, waiting to defend against a counter attack. Description: Fuuja Houin is a Fuuinjutsu technique used to counter-act the effects of a cursed seal. The ninja writes the needed seal characters on the ground and body of the person cursed with the seal. The ninja then forms the needed hand seals and places his hand over the cursed seal and then activates the written seal. The seal characters will then retreat to surround the cursed seal in a circular seal. Though the Fuuja Houin can work well against lesser seals, it will not be able to fully stop a cursed seal placed by a powerful, skilled ninja. Description: Ayatsuito no Jutsu is a Ninjutsu technique utilizing wire. This string can be used in rappeling, or as a method to tie down and restrict the movement of an opponent. The Uchiha clan also utilizes the wire in their Sharingan Soufuusha Sannotachi technique. The wire allows the clan member to pin down an opponent, and then unleash a torrent of fire upon them. Description: By gathering Wind Chakra in his hand, and then throwing his hand forward Kakashi can release a powerful, slicing wind that can knock down opponents, blow away attacks, or wound opponents. The wind will manifests itself as a large, powerful blast that will extend from Kakashi's person. Think of something like Temari's wind attacks, but more centralized. This technique was copied by Kakashi during his spar with Naruto. 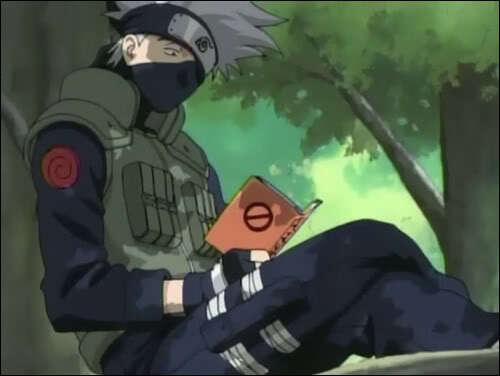 Description: Kakashi will appear to be reading a Book of some sort, usually "Come, Come." However, the Book will actually be a fake. Once thrown, the book will transform into smaller weapons. Such as shuriken, kunai, or senbon, they can come in at about groups of twenty. Description: Goukakyuu no Jutsu is a Ninjutsu technique utilizing the Fire Element. The Ninja does the necessary hand seals, draws Chakra from their mouth into their chest and them immediately exhales it. They then blow a stream of fire which erupts into a large sphere of flames. To better manage the flames the Ninja will bring their hand to their mouth to control it. Using one hand, Kakashi's pinky pulls down his mask, and his other fingers form sort of a circle to blow out the stream of fire; then, he quickly pulls the mask back up. He's copied this Ninjutsu from seeing it in use by Sasuke and Itachi multiple times. Description: Ryuuka no Jutsu is a Ninjutsu technique utilizing the Fire Element. After performing hand seals, the ninja uses a guiding line to unleash a large torrential fire burst onto the target, optionally binding the target to an object first so they don't escape. Kakashi's copied this move from seeing in use by several Ninja. Description: After performing five hand seals, Kakashi uses his Chakra to form a small kunai made out of electricity. Kakashi can use it up close like a regular kunai and/or throw it. However unlike a real kunai, it doesn't puncture the skin. It shocks the enemy, immobilizes them for several seconds. Kakashi copied this Jutsu from his Chuunin student, Kyo. Description: Tsuiga no Jutsu is a Ninjutsu technique used by Hatake Kakashi utilizing the Earth element. Kakashi will withdraw the tracking scroll from the pouch on his vest and wipe the blood of the one he wants tracked on it. After forming the needed handseals, he will slam the scroll onto the ground. This will release his nin dogs into the earth to follow their excellent sense of smell to track the targets blood. This allows Kakashi to track his short range target, even when he can not see them. This technique can also be used to set up his Raikiri. After finding their target the dogs will emerge from the ground to bite and pin down their target. This can allow Kakashi to execute the Raikiri without fear of a counter attack. Description: After performing a series of hand seals, Kakashi will stomp his foot on the ground, using earth and fire Chakra, the Jounin will cause the fire to flow out up to ten meters, and a pillar of fire reaching up to two meters will shoot up from the ground. He can perform this technique over half a dozen times before having to redo the Jutsu. Optionally, Kakashi can perform one hand seal to do one Fire Stomp. Description: Using mastery of the Raiton element, the user creates an suitable defense against Taijutsu strikes and small weapon strikes. By gathering chakra into the certain body part or area in need of defense, tiny plates of electricity form over the skin. They appear similarly to the scales of reptiles, hence the name. It can withstand several attack against small weapons I.E. shuriken and kunai quite easily. Taijutsu strikes will also be blocked as well as shock the opponent with moderate damage. If in case with a sword, it’s more of a 50/50 chance of blocks. [Depends on various factors; time, application of force of slash, etc]. However, defense against medium and long attacks are slim to none. The plate are too thin to defend against Ninjutsu. Kakashi copied this technique from his Chuunin student, Kyo. Description: Suiryuudan no Jutsu is a Ninjutsu technique utilizing the Water Element. The ninja does a long string of hand seals which then causes a column of water in the form of a dragon to rise from the water and then strike their target, the column of water is fairly large, so the amount of damage is quite heavy it it slams into their target head on. Description: Suijinheki is a Ninjutsu technique utilizing the Water Element. The ninja will first do a string of hand seals and then proceed to blow out a jet of water from their mouth to act as a water barrier from incoming attacks and things of the sort, including weaponry. Description: Suikoudan no Jutsu is a Ninjutsu technique utilizing the Water Element. The ninja does a string of hand seals which then causes a column of water to rise from the water and then strike their target. Kakashi copied this technique after a deadly meeting with the Akatsuki member Kisame. Description: The user needs a water supply to be able to use this Jutsu. If that is met, the user can create many needles out of water, then launch them at the opponent. If the needles are blocked, they will simply turn back into water. However, if they hit, they will pierce the skin and will have to be pulled out before they turn back into a liquid substance. Kakashi copied this Jutsu from Nikku's Summoning, Rabuka. Description: After performing several hand seals, Kakashi will stick one hand in a large body of water, a pillar of boiling hot liquid will rise from it, steam will come up from the pillar, the head of the it has the face of the wolf, and has two arms as well, claws at the end. The pillar will rush forward up to twenty meters in an attempt to hit it's target. The heat of the water is strong enough to give second, possibly third, degree burns if enough has connected with the body of the target. Description: This unnamed Ninjutsu technique allows Pein to blanket a wide area with a downpour of rain. He can maintain a connection to the rain and tell when someone is obstructing it. This also allows him to detect the individual's chakra level and skill. He can also drain ones chakra by this skill, although the drain is very light. Tobi copied this technique from his numerous interactions with Pein. And Kakashi copied this technique from seeing it in use several times. Description: After performing a seires of hand seals, Kakashi will grab his right hand as if he's going to perform the Chidori technique. Lightning will begin to form around his hand, the lightning is as strong as a weak Chidori, and lightning will extend out in the form of a large whip that can shrink or increase up to eight meters. The lightning will whip forward and grab onto a target, as soon as that happens, the electricity already flowing through it will shock the opponent, shocking the target for up to ten seconds. During that time, the whip cannot be removed unless it's cut by a Jutsu, and Kakashi will attempt to connect the weaker Chidori in his hand into the target. The weaker Chidori is about as strong as a B ranked attack. Description: After performing sveral hand seals, Kakashi will grab his hand, as if he's going to perform the Chidori. Lightning will begin to spark rapidly around his hand. He will either put the hand out into the air, into the water, or against the ground, the Lightning will zap out rapidly, sending 'mini-lightning bolts' forward. Where it hits is completely random, he cannot control it. However, if this Jutsu is used against the ground, the lightning will zap practically everything underneath the earth's surface, but the lightning will be weaker, only at B-ranked strength. Description: Daibakufu no Jutsu is a Ninjutsu technique utilizing the Water Element. After doing the needed hand seals a column of water will circle the ninja and then a large force of water will erupt to hit the attacker. Due to the force of the water the target will be fully enveloped by the water and at its mercy as is pulls them away. Description: Tajuu Kage Bunshin no Jutsu is an advanced variation of the Kage Bunshin Ninjutsu technique which was banned by the First Hokage. This has not stopped many Jounin-level ninja from learning the technique however. Instead of creating several clones, several hundred clones are created. Like normal Kage Bunshin a ninja's chakra is split evenly among the clones when created. The clones themself can utilize any jutsu the original ninja knows. When the clones finally disperse, any new knowledge they have gained is passed back to the original ninja and to any additional clones. This makes Tajuu Kage Bunshin an excellent training method if the ninja has the chakra capacity and stamina to maintain the Kage Bunshins for an extended period of time. This allows the ninja to essentially reduce the time it takes to train and learn with each clone added. With the great number of clones in Tajuu Kage Bunshin, the ninja can effectively learn in a few weeks with a hundred clones what would take one ninja numerous years. Description: Oodama Rasengan is an advanced Ninjutsu technique developed by Uzumaki Naruto. This larger Rasengan uses a Shadow Clone to form a more powerful version of the technique, causing a large explosion that can potentially rip apart the target. However, even though Kakashi can form a normal Rasengan without the help of a Shadow Clone, this technique specificly requires the use of a Shadow Clone. Kakashi's copied this technique from seeing it in use by Naruto several times. Description: Narakumi no Jutsu is a Genjutsu technique that causes its target to see a horrifying vision. The ninja will use the serpent hand seal to cause a circle of leaves to spin and envelop the target and then fall away. Once cast the world will appear normal to the target until they see the illusion. Description: Kakashi utilizes the Sharingan to hypnotically influence an enemies actions. Ludicrous suggestions like 'kill yourself' will not work. Requires eye contact to be used. If they realize they are being hypnotically influenced, they gain the ability to release themselves from the Genjutsu. If they succeed in breaking it, they get the chance to counter attack the Uchiha. However, if taken in again they won't realize they have been drawn back into the Genjutsu. This is harder for Kakashi because he only has one Uchiha eye. Description: Kakashi utilizes the Sharingan to hypnotically influence an enemies actions. If an enemy attempts to bring Kakashi into a Genjutsu, he will use his Sharingan to create a brief Genjutsu of his own. He will create a Genjutsu Clone, while the real Kakashi races off. Leaving the fake Kakashi stuck in the Genjutsu, while the opponet takes no notice to the real Kakashi fleeing. After about three seconds, the real Kakashi can be seen again, or.. if Kakashi gets to close to the opponet, he will be seen. But the fake Kakashi stays as long as the opponet believes the fake Kakashi, is actually real. Description: Kakashi utilizes the Sharingan to hypnotically influence an enemies actions. After making eye contact with his target, several of his Nin-Dogs will quickly jump from the ground, one on each limb. Their mouths are placed so that their teeth don't appear to be bitting the flesh. The target cannot move, their limbs are pointed downward, firmly in place. If they realize they are being hypnotically influenced, they gain the ability to release themselves from the Genjutsu by focusing hard enough. If they succeed in breaking it, they are freed completely from the Genjutsu. Description: Kakashi utilizes the Sharingan to hypnotically influence an enemies actions. After making eye contact with his target, they will appear in a large black space, dark chains by the thousands criss crossing eachother, some farther out than others. The target will be in the middle, chains gripped to their feet, a hooked chain piercing into their shoulder, and another hooked chain pierced onto their side. A feeling of crampness, heat, and horrible pain from the tightness of the chains, and the fact that steel is hooked onto their flesh, will occur. This requires Kakashi to stand absolutely still, if he steps forward even the slightest, the Genjutsu will be broken. Every five minutes in 'Hell' is only one minute in real life. This takes a large amount of stress on Kakashi's eye, and can only perform the illusion for around five minutes. But will leave the target mentally exahusted. The Genjutsu can be broken if an outside source deals pain to the target or stops Kakashi. After seeing Itachi use his powerful Genjutsu, he sort of 'copied' the general idea of it to create one of his own. Description: After performing several hand seals, Kakashi will pull out his famous Hatake Family Tanto. Gripping the end of the handle, a large white aura of Chakra will surround the sword, larger than the usual amount. It increases it's strength slightly, but it does increase it's length but a large amount. Description: After performing several hand seals, Kakashi will pull out his famous Hatake Family Tanto. Gripping the end of the handle, a large amount of electricity will form around the white Chakra of the sword. Giving it similar properties to the Chidori technique, enabling it to cut through objects, and each strike will give off a discharge of lightning to it's target. Description: Though it is called "Leaf's Ancient Supreme Technique", Sennen Goroshi serves more as an insulting shock technique rather than a skilled Taijutsu technique. The ninja forms their hands into the seal of the tiger, and then jabs their fingers into the nether regions of their target. The result is shocking violation of the targets sanctity and often their launching in the air to stop the awkward feeling. Description: Konoha Kage Buyou is a Taijutsu technique that is used to position a ninja's opponent into a vulnerable aerial position. The ninja will first quickly appear below their opponent, then with a switch upper kick they will launch their target into the air. The ninja will then jump into the air to "shadow" the target with the target's back to their chest. Description: Releases the brains restraints allowing full power usage of the body's muscles. This is opened to prepare the body to use Omote Renge. This gate is located in the head. Kakashi has copied this technique by seeing it in use by Gai and Lee. He has been seen using this technique will climbing a rocky wall with only one hand. Description: Omote Renge is a Taijutsu technique which was forbidden due to the strain it puts on a ninja's body. To utilize the Omote Renge, Kakashi first loosens the bandages around his arm. With a quick dash he is suddenly below his target and a quick upward kick sends his opponent skyward. Kakashi then jumps into the air to place his chest to the back of his opponent. He then wraps his arms and the bandages around his opponent to prevent escape. As the pair begin their fall back to earth, Kakashi begins to spin downwards at a high rate of speed, driving his opponent head first into the ground. At the last moment Kakashi himself releases the bandages and jumps to the clear. Story: Kakashi was only a young boy when his father died. He aborted a mission that cost his village dearly, with the reason for the abortion being the safety of his comrades. Shamed, Sakumo took his own life. Kakashi grew up with a cold attitude, thinking missions were the most important thing, until a life changing experience that killed his friend Obito. A few years after this, he found a contract that his father left behind for Kakashi when he turned eighteen, it was a group of dogs that had excellent skills, something Kakashi would need dearly later on in life. Description: These dogs serve as the personal summon of Hatake Kakashi. He can summon the whole pack or one individual dog when desired. They can be used to track someone as long as Kakashi has some form of the person’s scent. They are not often brought out for fighting unless it’s with conjunction with his Tracking Fan Technique. Description: After biting his finger, or drawing blood, Kakashi will use it to summon Taurus, a large Nin-Dog. It's above five feet tall while standing on it's four paws. It has a large jaw, capable of bitting through incredibly tough objects. It also can carry several adult humans on it's back at a time. Description: After biting his finger and drawing blood from it, Kakashi will form a series of hand seals and slam both hands into the ground. Seals will begin to curl along the ground, then, a large cloud of white smoke will rise from the writing, summoning a large dog with three heads. The dog is thirty feet high, it's eyes are red, it's fur a dark brown, it's teeth white and sharp, it's tail six feet long, and it's muscles are compact. The dog is extremely dangerous to use and be quite a pain to use. For it will often disobey Kakashi's orders, similar to Orochimaru's snake summon. So, if the situation calls for it, Kakashi will use his Sharingan eye to put Cerberus into a hypnotic state, causing him to follow Kakashi's orders, the dog's eyes will appear similar to the Sharingan. Description: Goukakyuu no Jutsu is a Ninjutsu technique utilizing the Fire Element. The Ninja does the necessary hand seals, draws Chakra from their mouth into their chest and them immediately exhales it. They then blow a stream of fire which erupts into a large sphere of flames. To better manage the flames the Ninja will bring their hand to their mouth to control it. With extra hand seals, Cerberus can spit out several of these at a time. Description: After perform several hand seals, Cerberus will lift the front of it's body into the air and slam it's claws into the ground, expelling out fire from them, flames reaching up to three meters will burst up from the ground randomly around it in a twenty meter radius. Only summon who can detect Chakra flow, someone like Kakashi, can hope to see the pillars of fire before they reach the surface. Description: Suiryuudan no Jutsu is a Ninjutsu technique utilizing the Water Element. The ninja does a long string of hand seals which then causes a column of water in the form of a dragon to rise from the water and then strike their target, the column of water is fairly large, so the amount of damage is quite heavy it it slams into their target head on. If Cerberus happens to drink the water first, it can shoot out the Jutsu from it's mouth. Description: After performing several hand seals, Cerberus will stick one hand in a large body of water, a pillar of boiling hot liquid will rise from it, steam will come up from the pillar, the head of the it has the face of the wolf, and has two arms as well, claws at the end. The pillar will rush forward up to twenty meters in an attempt to hit it's target. The heat of the water is strong enough to give second, possibly third, degree burns if enough has connected with the body of the target. Or, if the left head of Cerberus happened to drink the water first, the wolf pillar will simply come from his mouth. Description: After performing sveral hand seals, Cerberus's middle head will open it's mouth, forming a large orb of electricity, the orb will stay there until the Chakra inside of it runs out. Cerberus can shoot out bolts of lightning, the strength of each as strong as a C ranked technique, over a dozen times. Or, he can shoot out four or five bolts, having the strength of a B ranked technique. Description: Without performing any hand seals, each head of Cerberus will charge an orb of Chakra in each of their open mouths, after doing so they can shoot out a solid beam of Chakra up to twenty meters away, doing heavy damage to it's surroundings. These beams of Chakra lasts up to fifteen seconds.